We have several Helmut Lang staple pieces in our sale such as basic T-shirts & tanks and the split skirts which has been worn by several models and actors. Rosie Huntington-Whiteley wears her Helmut Lang skirt with a Helmut Lang sweater. 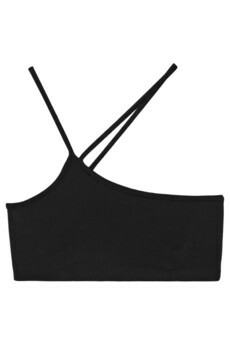 We still have this Helmut Lang crop top left, which can be paired with bikini bottoms to jeans shorts. 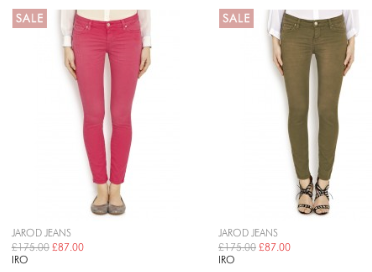 Iro has become the fast favourite by many for their tailored leather jackets and their colourful & comfortable jeans. We have these jeans shorts in many colours, they can be worn with a basic Helmut Lang T-shirt and one of our Iro leather jackets or dressed up with a simple white blouse. Forte forte is increasingly becoming more popular for their high quality and ethereal feel. Nicole Richie teams her Forte Forte blouse with jeans shorts and sandals or boots.